What is common between the Congress, BJP, DMK, VHP, RSS and a host of other groups and parties? And let us further make clear that we expect an answer that is extremely positive. A shocking question for there apparently is nothing common. Let us put forth another question that produces the same answer - what is common between Sanathana Dharma, Islam, Christianity, Sikhism, Buddhism, Jainism, Confucianism and Taoism? The answer - Sathya Sai Baba - is becoming more evident and clear with each passing day! In today’s times, all roads lead not to Rome but to Puttaparthi. Little wonder that the great scientific writer and devotee, Howard Murphet, called Prashanti Nilayam as the abode ‘where the road ends’! On March 18 was the day when all the elite and heads from the Rashtriya Swayam Sevak Sangh (RSS) undertook the ‘Puttaparthi Pravas’ or the pilgrimage to Puttaparthi to offer themselves at His lotus feet. At 7 p.m., Swami arrived from Yajur Mandir. He took a complete darshan round in the car and alighted at the interview room. 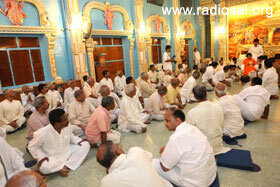 He moved straight into the Bhajan Hall where the members of the RSS were seated. A group of veteran leaders of the above mentioned organization along with the VHP veteran and supremo, Mr. Ashok Singhal welcomed Swami. The Lord sat in the front facing the ‘Adhikaris’ - a group of over 50, including some women, belonging to all India and regional cadre of RSS and allied organisations, holding positions of authority. As soon as Swami was seated, Mr. Singhal almost announced in Swami’s presence, “Swami, these are people who for the last 30 or so years have dedicated themselves in the service of the nation. They are all bachelors and have sacrificed everything for the cause of preservation of culture of this country.” Swami smiled and said that He was very happy. He blessed them and motioned that He would go through the rows of these volunteers. 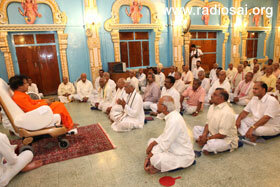 As Swami moved amidst them, He collected letters and gave vibhuti to some. He spoke to a few others and gave padanamaskar to all. All those assembled were very disciplined in their gestures and interaction with Swami and there was perfect order - a reflection of the rigorous practise they had all imbibed in their lives. Swami slowly completed moving around and when He neared Mr. Ashok Singhal, He lovingly held his hand and had words of appreciation for him. He then arrived to the front and expressed His happiness. Prominent members in the group included RSS Chief, Mr. Mohanji Bhagavat, former Chief Mr. K. K. Sudarshan, General Secretary Mr. Suresh Joshi, Joint General Secretaries Mr. Suresh Soni and Mr. Datta Hosabale. 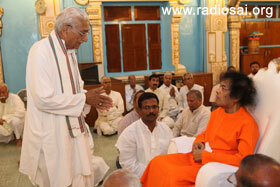 As a token of His love and blessings, Swami personally handed over vibhuti packets to about a dozen people. He then instructed that these packets be distributed to all. Blessing everyone, Swami moved out of the Bhajan Hall in about twenty minutes. Swami moved to the stage and sat for bhajans. 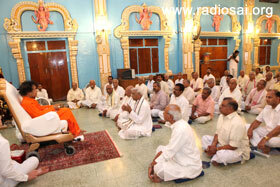 The RSS members too moved out and sat to His right in a specially allocated place. After a couple of bhajans, Swami asked for aarthi. 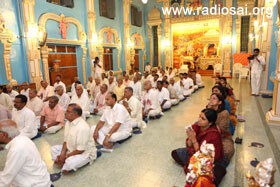 Blessing the audience, Swami retired for the day at 7:40 p.m.